Need some motivation during your workout? The new ProForm Tour de France Centennial Training Bike--out in mid-August--will supply just the cheers you've been looking for. We got a sneak peak at the bike, and, well--wow. 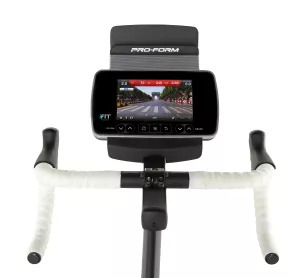 It hooks up to WiFi and you can connect it to Google Maps Street View so that you can simulate a real ride of your choice on the 7-inch color touchscreen. Plus, all 21 stages of the Tour de France are already programmed into the bike with video from the 2012 tour sidelines. 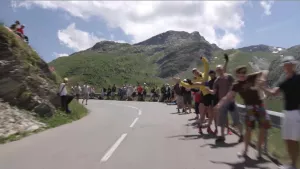 Get ready to hear the crowd cheer as you reach the double climb of Alpe d'Huez at Stage 18. We gave it a try and while the saddle isn't all that comfortable, the company says many people--often those training for bike races or the Tour de France--switch out the saddle and pedals and use their own. The bike has 30 configurable electronic gears on the handle bars and the bike simulates the feel of uphill and downhill ride, which can make you feel like you're actually out on the trail. Surprisingly, the bike is still pretty quiet despite all the bells and whistles. With a 20% incline and decline, all the features and thrills you'd experience with an outdoor ride are available right at your finger tips. Is there any other way to get a sense of the real Tour de France, without actually hitting the road? The 2013 TDF Centennial is available for pre-order, and costs about $2000. Visit Proform.com to see a video of the bike in action.